Our strongest most durable tailgate yet. Sleek curved design reduces drag to increase gas mileage. Our strongest most durable tailgate yet. Louvered gate is blow molded and composed of glass filled plastic for strength, durability and good looks, that can be painted to match your vehicle. Center pull handles make it easy to operate with one hand. Sleek curved design reduces drag to increase gas mileage. 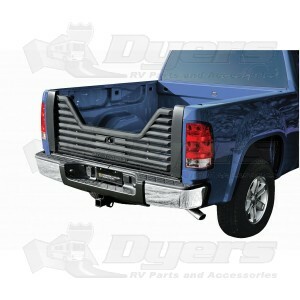 All the features you want in a durable, lighter weight, non-rusting tailgate that is locked to your vehicle!